I sometimes mention that I am 'on the train' when writing these stories, but this one will take a bit of a different approach to that method of transportation. The platforms of Kanda Station in Tokyo - a place where I make the transfer from the subway to the main train system whenever I travel back and forth between Asakusa and Ome - are elevated above the surrounding streets, and from one of them you can look onto a nearby building and see signs announcing that the place holds a model railroad shop. That's nothing out of the ordinary, but on one of the signs is the added information 'National Chain: Shop #39'. Eh? A chain of (at least!) 39 model railroad shops? Think of the expenses involved! There must be at least 39 employees, probably many more, plus all the other related expenses - rent, utilities, etc. and etc., all on top of the cost of supplying the goods. Is there that much interest in model trains in society as a whole, to support such an undertaking? Could we at Mokuhankan even conceive of a chain of 39 woodblock print shops? The idea seems bizarre, but why should such a thing be possible for them and not for us? Is there any inherent barrier involved here, or could we actually build up such popularity, if we went about it in the right way? Consider a comparison of their customer 'base' and ours. Who are their customers? I may be completely wrong here, but I would guess that two main groups of people make up the bulk of their clientele: retired guys building and playing with trains, and younger 'otaku' types who collect and display them. (I doubt that these shops deal in the little wooden toys that every child plays with.) I would bet that most people climbing the stairs to that shop come from those two groups. Who are our customers? Well, after more than 25 years of sending woodblock prints out into society, I can tell you there is no easily defined pattern. Pretty much any 'type' of person you think of, has been represented in my collector list somewhere along the line; our prints appeal to people from all walks of life. And especially these days, when we are making a genre of prints that are interesting to even very young people, it's nearly impossible to categorize our customers. So given such a very large advantage for our side compared to the model railroad suppliers for the number of potential purchasers of our products, why are they so far ahead of us? I think the answer is clear – incompetence and lack of imagination on the part of the print publishers over the past 100 years or so. This business was flourishing back in the Meiji period, with any number of publishers creating hundreds of beautiful prints every year, but as times changed they for some reason gave up on the idea that they could/should be creating products that had relevance to society around them, and instead took refuge under the 'traditional' banner, limiting themselves to the tourist trinket market. It took them nearly a century to do it, but they pretty much totally destroyed the woodblock print business. And that's no exaggeration. Out of any randomly selected group of people in society today, how many do you think have woodblock prints in their home? How many even know what they are? A very very low number, to be sure. Well in one sense, this is very good news for us. Given such a terrible situation, there is only one way to go, and that is up! I should emphasize that I'm not an 'empire builder', and I have no desire at all to have Mokuhankan become a 'chain'. But I would like to think that through our policy of making prints that have relevance to people, we can build a place that is large enough to have a stable foundation, that is widely known and recognized, and which should thus have a pretty good chance of surviving into the future, if properly managed. 'We' were there once before, and we can be there again. It just requires a clear vision of our destination, and then ... (wait for it) ... to head straight down that track! I thought it would be kind of impolite to write about the place and not even take a look at it, so I visited the other day. They don't deal in just model trains … they seem to mainly deal in things like this! 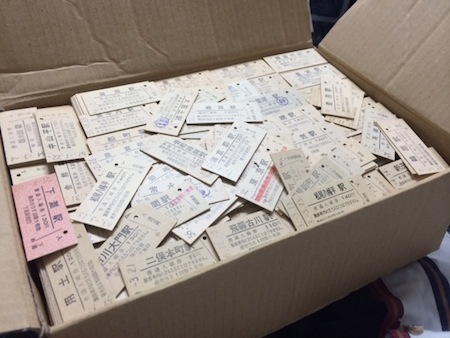 Boxes of used tickets, old signboards, menus from trains long gone … it's a national chain of train memorabilia shops! Good grief - if we can't 'rise' to that level, we don't deserve to be in business!